Half of my friends will read the title of this entry and think “Courier? US Robotics Modem?” and the other half will think “warez”. This article is for the latter half. Back in the mid-1980s, there were essentially two places you could get warez from: Friends, and BBSes. You might find the occasional bootleg in a store, but 99% of the scene was about personal hook-ups and online trading. Young Trixter started out his computer gaming life getting games from friends and spreading them to BBSes for download credits, then using those credits to download other games to add to his collection (and spread to more friends and BBSes.) In warez parlance, young Trixter was a courier: A person who spreads games from person to person and place to place. At first, copying software was about trying cool games for his new computer. But after a while, young Trixter became a bit obsessed and wanted to take things to the next level. What’s the next level for a waycourier? A supplier. A supplier is someone who supplies the games to the crackers in the first place. Software piracy begins with suppliers; they’re the first link in the chain. Suppliers can be anyone and come from anywhere, like software engineers providing beta copies to friends, people who work in the packaging companies or distribution warehouses that let a box or two fall off the back of the truck, or people who work at software stores. Young Trixter was the latter. Exactly two months after young Trixter turned 16, he started working at Babbage’s, a software store chain located in a nearby mall. In his defense, he started working there not to become a supplier, but because it was a dream job to be surrounded by software and people talking about software. (That, and his existing job of bagging groceries was, shall we say, a demoralizing endeavor that left emotional scars.) But when young Trixter found out that Babbage’s had a take-home policy (let’s pause for a second and reiterate that they had a TAKE-HOME POLICY), his path was set in motion. The take-home policy existed in a time before software viruses, where you were not merely allowed but encouraged to take software home to try it out, so that you could learn more about it to help sell it to customers. Some stores even had machines in the back room that you could play with to this end (off the clock, of course). When you brought it back the next day, you simply used the shrinkwrap machine in back to re-shrink the package, resticker it, and put it back out on the shelf. You can imagine how many neurons exploded in young Trixter’s head when he learned he could do this. It wasn’t all milk and honey; there were roadblocks. Most game software was copy-protected. Some software came in an envelope that, were you to open it, indicates your acceptance of the EULA (but more importantly, destroys the envelope). But young Trixter was determined. For envelopes, he tried many experiments and eventually found that a very thin knife, passed extremely slowly between the flap and the envelope, could separate most glues without damaging the paper. He would reseal it with rubber cement, which mimicked most glue textures used on EULA envelope flaps. A few envelopes would require a hot air blower to melt the glue, but this wasn’t a problem because all software stores conveniently had one next to the shrinkwrap machine (because heat was needed to, you know, shrink the wrap). After confessing his refined envelope method to a co-worker a few months later, young Trixter was shocked to hear the other young man’s alternate solution, which was almost zen-like in it’s simplicity: Simply throw the opened envelope away. Customers don’t get mad over opened envelopes if they don’t know an envelope was ever in the package. The copy-protection proved to be a much more difficult problem. Young Trixter was not a cracker; he didn’t have the assembler experience for that (yet). What he did have was fierce determination, strong drive, lots of caffeine, and a teenager physiology that could withstand days without sleep. So young Trixter spent months learning all about how diskette-based copy-protection works on the IBM PC. He researched copy utilities, unprotectors, decryptors. Some games he could unprotect himself using tools and knowledge, and this allowed them to be supplied and couriered. He discovered Snatchit and was able to use it to supply protected diskette images to crackers. 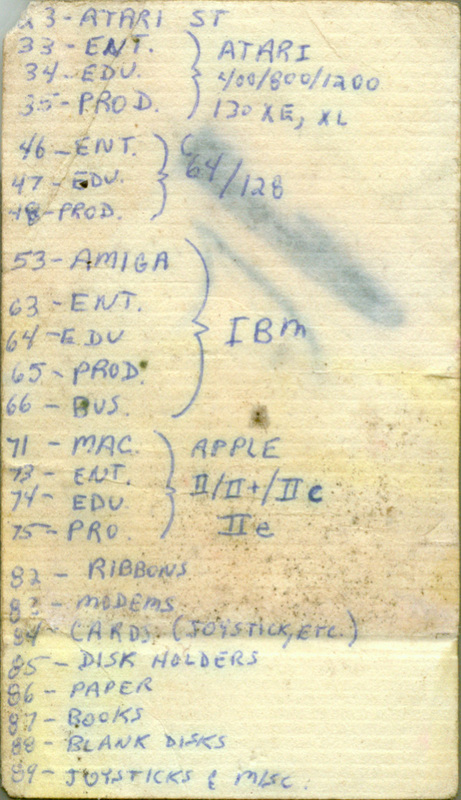 For the most stubborn of all software, he spent half a month’s pay on a Central Point Option Board, which not only dominated diskettes but also allowed the truly difficult software to be supplied to a few select crackers who also had Option Boards by trading special “TransCopy images” in secluded BBS file areas. But it wouldn’t matter for long, because the creator/maintainer of the Option Board died, and Central Point was purchased by Symantec, so that coffin was finally nailed shut. Eventually, young Trixter threw himself into the demoscene, where he had fun creating and enjoying software instead of copying and hoarding it, and the warez chapters of his life story came to a close. Remind me sometime to tell you about the oldwarez boyz. Or the birth of Abandonware. Or Demonlord’s protection diary. Until then, take a peek at the back of young Trixter’s Babbage’s business card, which had all of the primary SKUs written down and what they were for. If you ever wanted to know what a software store stocked in 1987, well… now you know. That’s right: SKUs for printer ribbons and diskette holders. How times have changed. This entry was posted on July 21, 2008 at 11:28 pm	and is filed under Software Piracy. You can follow any responses to this entry through the RSS 2.0 feed. You can leave a response, or trackback from your own site. I had a short seasonal position at a Software Etc. (it had merged with Babbages already) during the 1997 Christmas season. If I recall the take home policy was still in effect, but you had to work there for a minimum amount of time (about 6 weeks). The employee discount took effect right away however and even applied at Barnes & Noble bookstores (they were the parent company at the time). It got used quite a bit the 4 weeks I worked there. Whats odd is that I wasn’t permitted to ring up customers, only assist them. What really ruined the take home policy was the trend towards packaging the install media in envelopes that required you to agree to a EULA if you opened them. Once opened, I believe it could only be sold as “open box” at a reduced rate, so taking stuff home was strongly discouraged. I did become a professional shrink wrapper though. After that job I was scarred from ever working retail again. I became a computer tech at a locally owned shop instead… and really didn’t have to deal with customers. I want to know more about the guy who died!